Charles Fries (1854-1940) o/c # 1503 Vallecitos Valley, original frame. May 1932 p.o.r. This painting is listed in Fries diary. 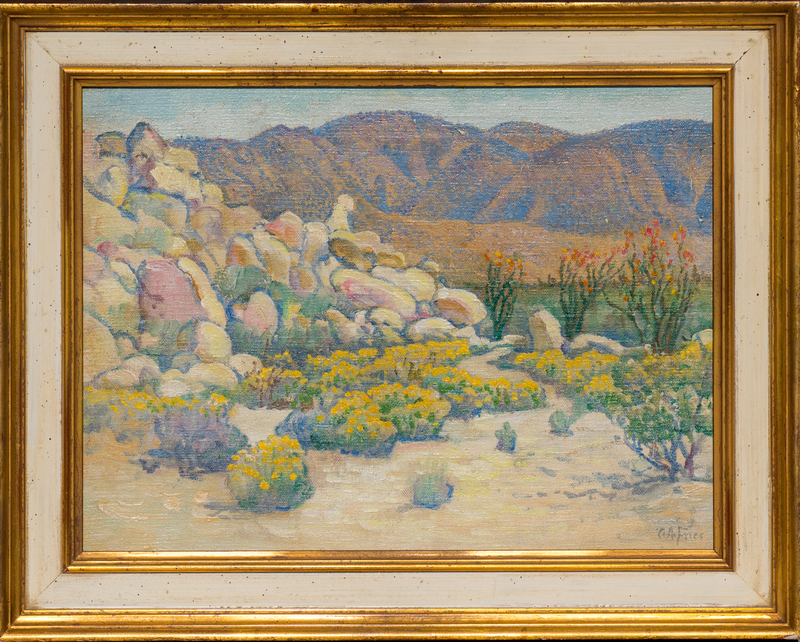 Born in Hillsboro, Ohio, Charles Fries was referred to as the dean of San Diego artists from the time he settled in that city in 1897. His reputation was based on magnificent atmospheric desert landscapes, many of them showing historical scenes of the state. He was raised in Cincinnati and apprenticed there to a lithographer and then studied portraiture at McMicken Art Academy where he associated with other men who became famous artists–J.H. Twachtman, Robert Blum, Kenyon Cox, and Frank Duveneck. He traveled from his Cincinnati studio to sketch in the Southwest, and his lithographs of these travels appeared in “Harper’s,” “Leslie’s,” and “Century” magazines. When he was seventeen years old, he began working in New York City as an illustrator and portrait painter, and five years later, he went to Europe for art study and received many laudatory reviews in Paris journals for his painting. In 1887, he returned to the United States, married and lived on a farm in Vermont, and then moved to California in 1896. He and his family lived briefly in the ruins of San Juan Capistrano, before building an adobe house and studio in San Diego. An avid bicyclist with a Van Dyke beard, flowing black tie, gentle manner, and twinkling eyes, he was a memorable sight with his painting gear in his basket. His journal records seventeen hundred California oil paintings, many of them with eucalyptus trees, and he was highly successful there also as a lithographer.